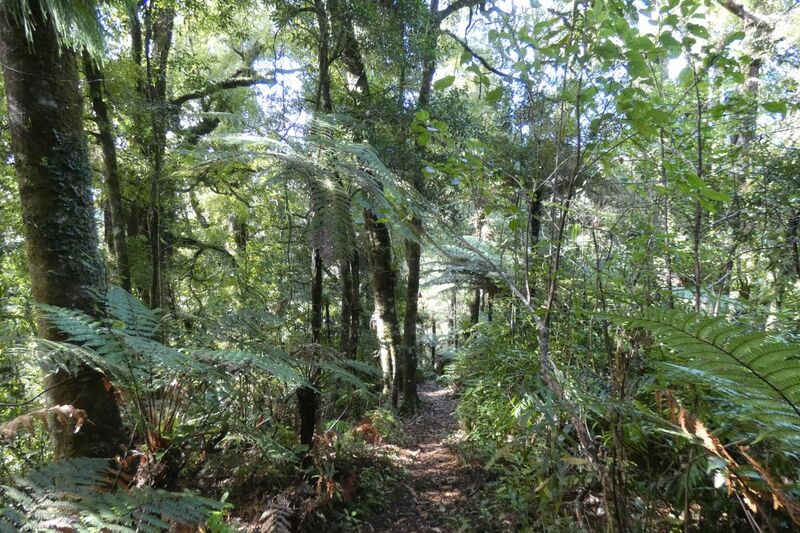 The Kaharoa Kokako Track, also known as Kaharoa Track, Kokako Track, or Hollow Track, leads down from Kapukapu Road to the Onaia Stream. 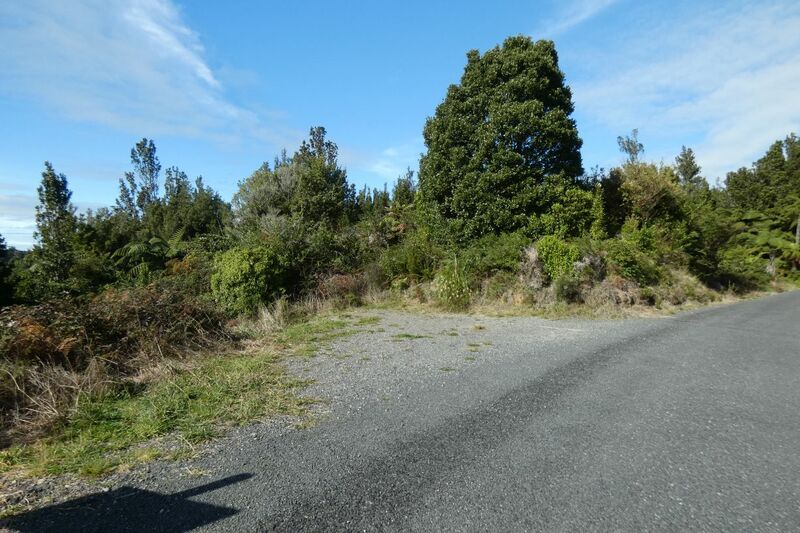 It is located about 30 km by road north of Rotorua, and 55 km south of Tauranga, off Tauranga Direct Road (SH36), via Kaharoa Road and Kapukapu Road. There is a parking area and information panels located by Kapukapu Road about 600 metres from the start of the track. At the track start there is only parking available for 2 or 3 vehicles. 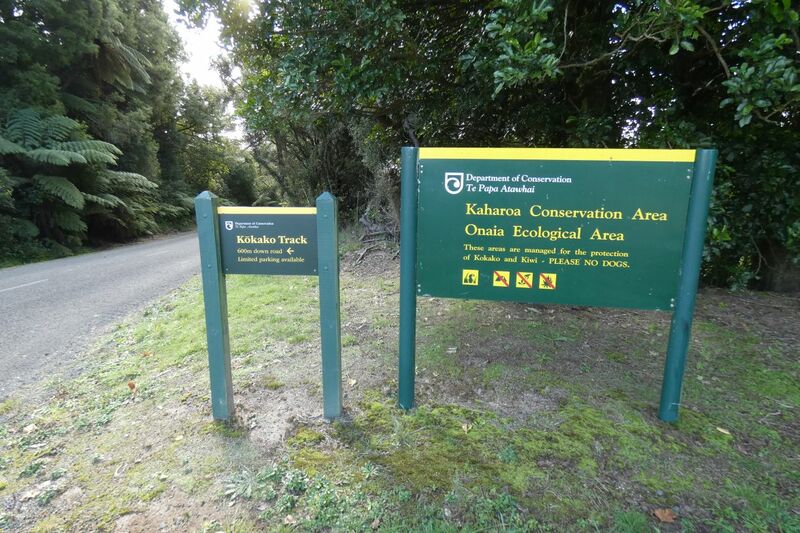 The Kaharoa Kokako Trust was formed in 1997 as a charitable trust to ensure the long-term protection and survival of kokako at Kaharoa. 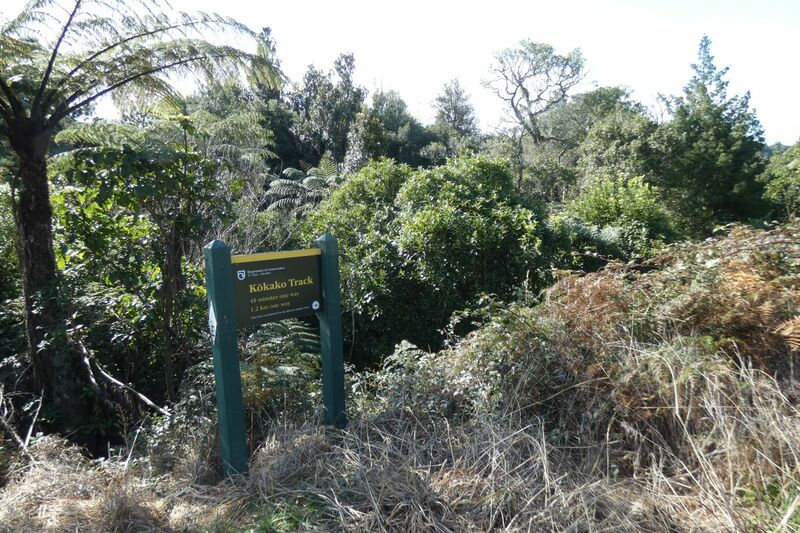 Predator control is an ongoing task in helping to protect the habitat of the endangered kokako as well as other native birds such as kiwi in the Kaharoa Conservation Area. The track starts about 8.5 km from the start of Kapukapu Road, a sealed no-exit road which ends a few hundred metres from the track start. There are no toilets or other facilities by the parking area or the track. The best time of day to observe and hear the kokako is at dawn, but they can also be heard at other times of the day. Various other native birds such as tui, fantail, North Island robin, and kereru can also be seen and heard along the track. The track is about 1.2 km long, and drops about 100 metres from the start to the end by Onaia Stream. The first part of the track is mostly a gentle contour down a ridgeline, with the last part of the track steeper but with steps at the steepest locations. Return is by the same track. The estimated time for the track itself, according to the DoC sign, is about 45 minutes in each direction. Information about the track can be found on the DoC web site. 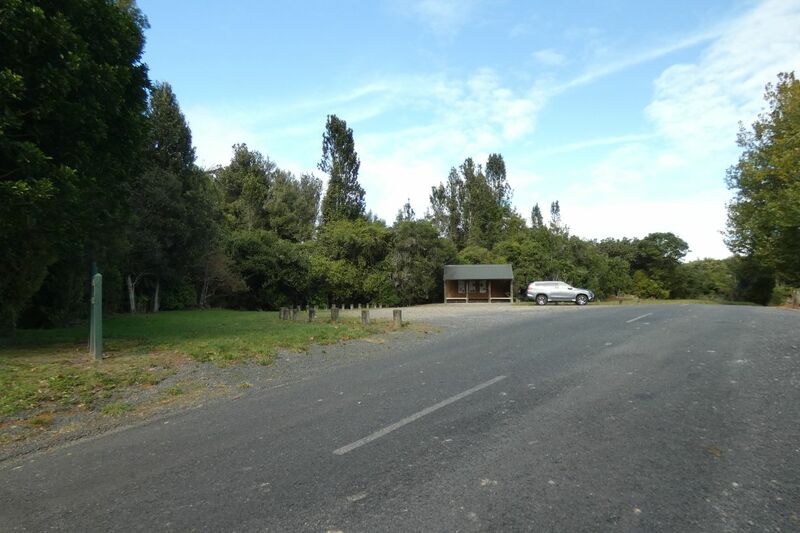 The parking area alongside Kapukapu Road, with a shelter containing three information panels about the conservation area, the kokako, and the trust and pest control program. Looking back towards Kaharoa Road. The start of the track is about a 600 metre or 10 minute walk along Kapukapu Road. Dogs are not permitted in the conservation area. The small parking area at the start of the track. The track starts just left of picture centre. The DoC sign by the small parking area at the start of the track. 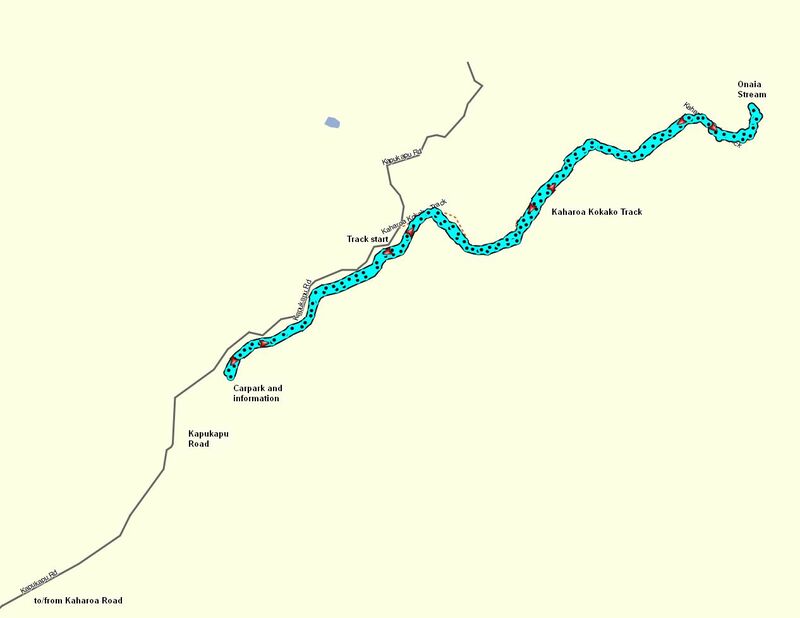 Here it is just designated as Kokako Track, with a time of 45 minutes and distance of 1.2 km each way. 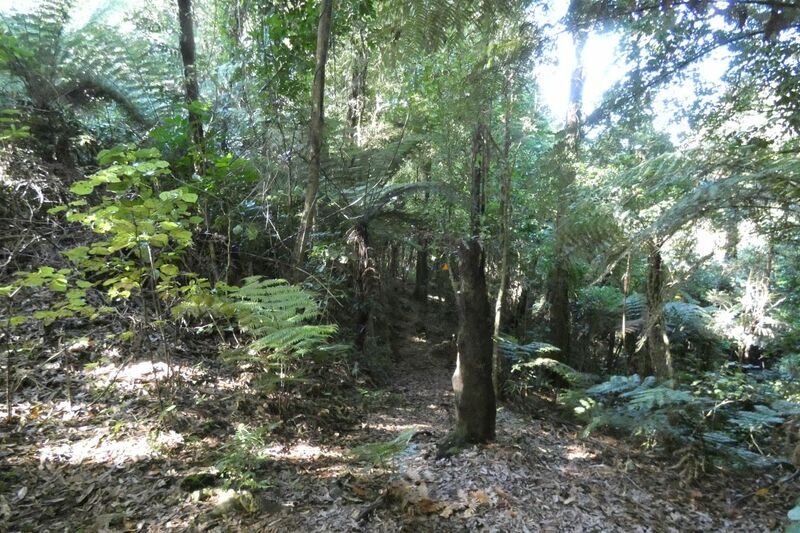 The start of the track leading through blackberry to the area of native bush. 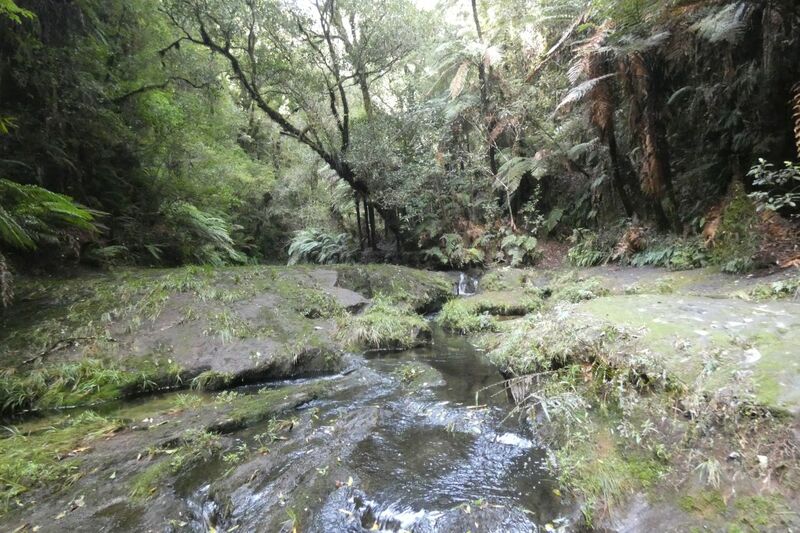 The bush is quite open near the start of the track, but becomes denser as the track descends towards the stream. 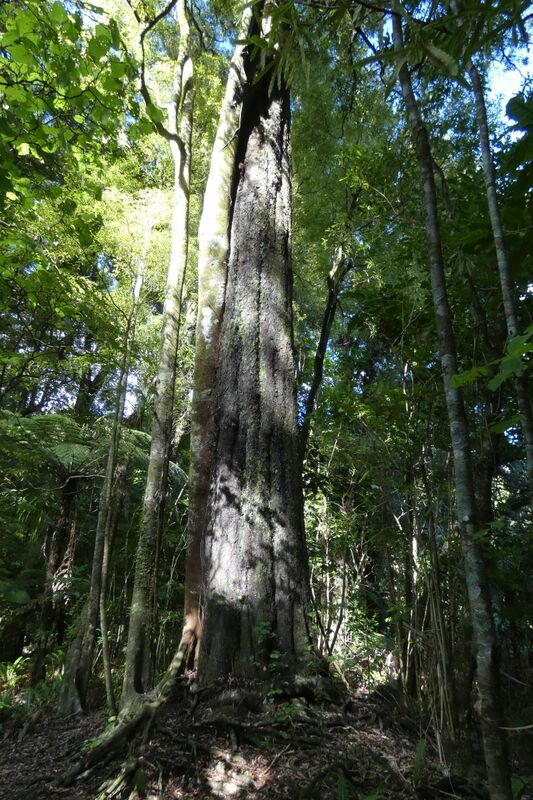 There are some very tall and straight rimu trees along the track. Here one of the largest with a companion tree almost merging with it. The track descends more steeply on the approach to the stream. 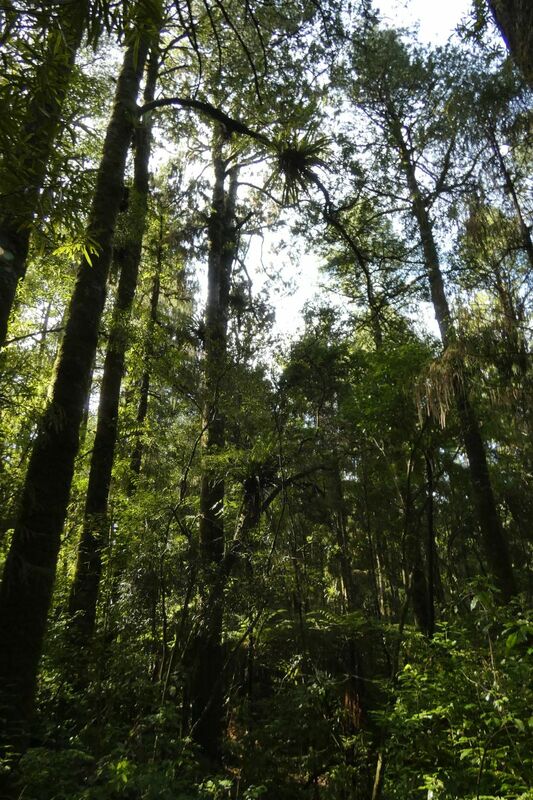 More tall and straight, but somewhat smaller diameter rimu trees along the track. 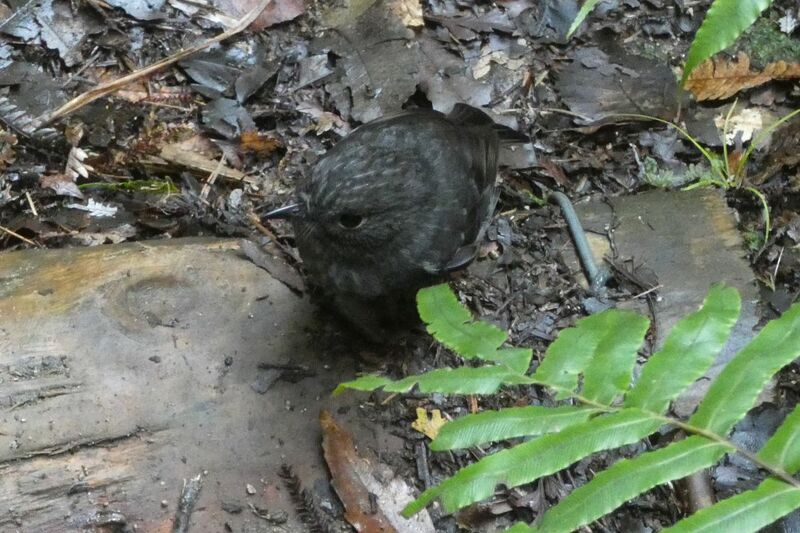 The North Island robin does not show much fear of humans, approaching to within about a metre in it’s search for food in the leaf litter on the forest floor. 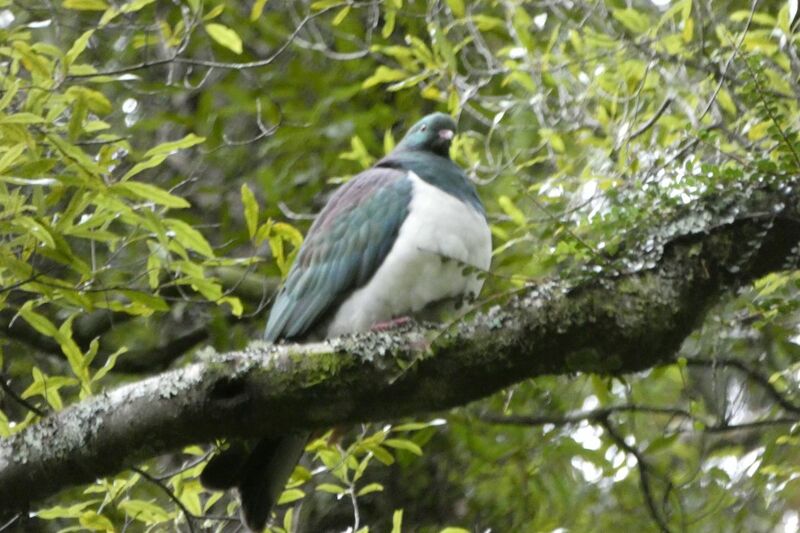 This kereru or native wood pigeon looks to be well fed on fruits of the forest. The track (on the right) ends at the Onaia Stream, which has carved its way through the rock. There was evidence of recent flooding of the stream. The rock floor is very slippery, with moss and moisture. The stream can easily be crossed at this point, and there is a flat area on the left which could be a suitable picnic spot. The GPS tracklog shows the location of the track and the section of road between the carpark area and the start of the track. The total time for the walk was about 1 hour 45 minutes, including ample time for photos and a lunch break by the stream, with a distance of 3.7 km. From the carpark to the track start is about 600 metres and took about 10 minutes. 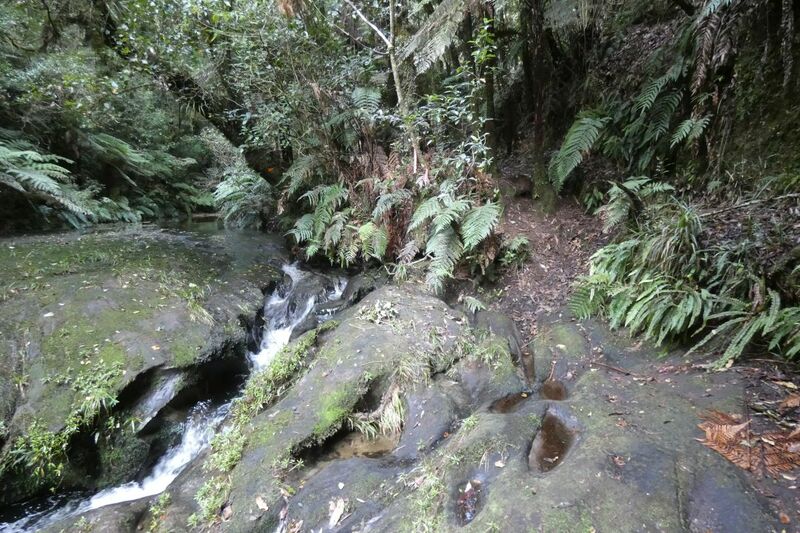 The track itself is 1.2 km long, and took 40 minutes for the walk down to the stream and 30 minutes for the return back to Kapukapu Road. Almost all the photos were taken on the downhill walk. The altitude at the parking area is about 320 metres above sea level, at the track start about 310 metres, and at the stream about 200 metres. 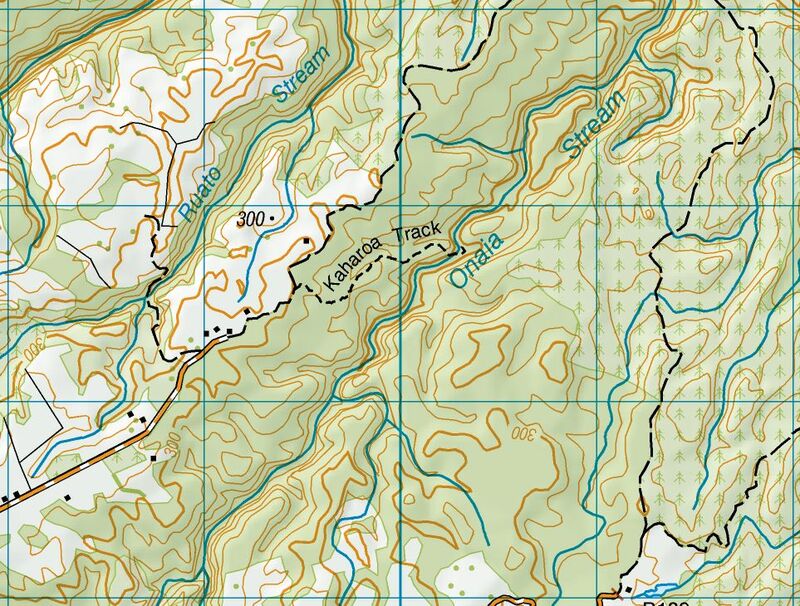 The topographic map excerpt shows the topography of the area, with the track shown as Kaharoa Track. 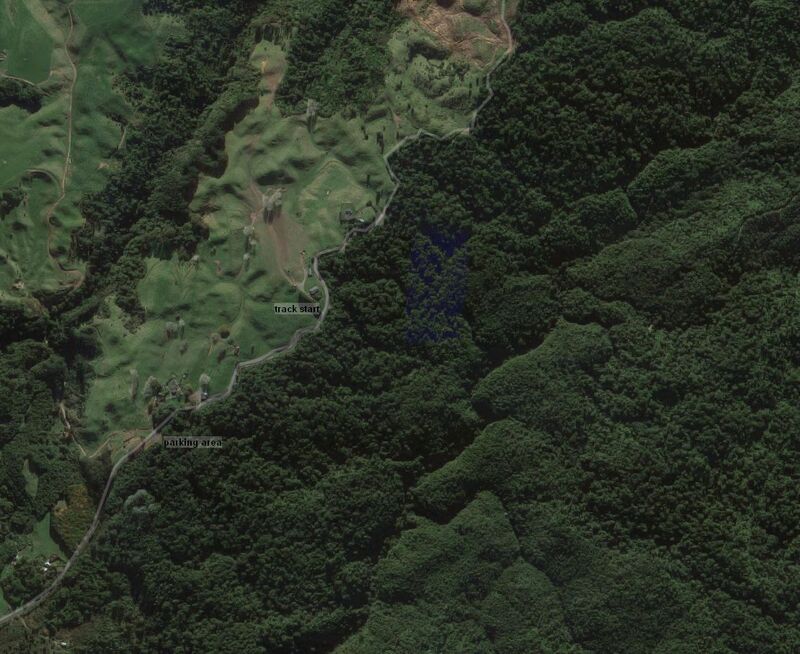 The aerial image, from Google Maps, shows the dense forest canopy at the track and surrounding area, with farmland on the other side of Kapukapu Road. The track was walked on April 23, 2017. 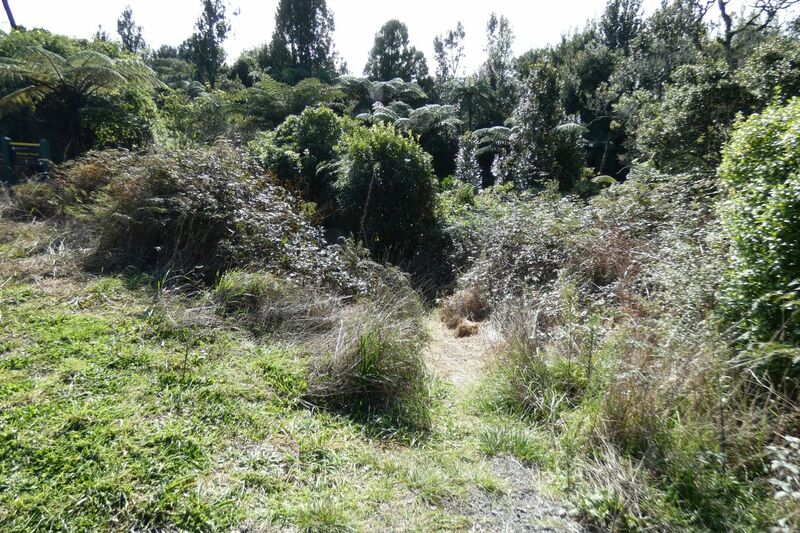 This entry was posted in Walks and tagged Kaharoa, Kokako, Rotorua on 2017-04-23 by nzartig.